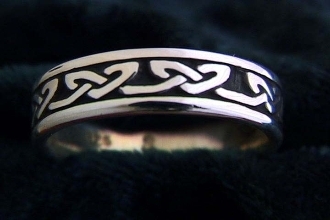 Our Products >> KNOTWORK BAND RINGS >> "Celtic Hearts Ring"
Celtic Hearts, Trinity Hearts Band. Although the width of this design is around 5.5 mm, the thickness of the band makes it a solid weight. This makes this ring best for those that like the weight and feel of a heavier ring type, even though it is not particularly wide on your finger. The sizes on this ring run a little bit smaller than stated, so if you have a specific size request, email that at the same time as your order, as I can custom adjust to "true" sizes. This simple original design connects one heart to the next in a way that is also reminiscent of a trinity pattern. As it is a continuous knot, and therefore also reflects the eternal nature of the life, death, rebirth process.